The Waco Mailplanes are a range of two US-built open-cockpit mail biplane designs of the late 1920s. 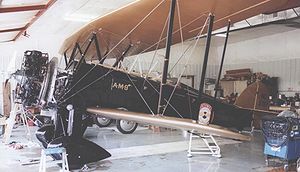 In order to meet the continuing United States demand for rugged mailplanes, Waco aircraft developed two models of large biplanes during 1929, the JYM and the JWM. The JYM was a taperwing model based on the earlier ATO design but with a 14-inch fuselage stretch to provide further cargo capacity compared with the earlier design. It was powered by a 300 h.p. Wright J-6-9 engine and had a single seat cockpit for the pilot. The JWM was a straight-wing model based on the ASO with a 14-inch longer fuselage for increased mail-carrying capacity and was fitted with a 330 h.p. Wright R-975 powerplant. Four Waco JYM aircraft were delivered to Northwest Airways (later Northwest Airlines) in 1929 and were operated by them on the 892-mile CAM-9 airmail route from Chicago to Minneapolis via Milwaukee, Madison and La Crosse.. The third JYM NC991H is the sole survivor of the quartet and is displayed in airworthy condition in the Historic Aircraft Restoration Museum (HARM) at Dauster Field near St Louis, Missouri, wearing its 1929 NWAL CAM-9 route markings. Two Waco JWM aircraft were delivered. The sole survivor NX8550 is also preserved at HARM, wearing the markings of the "Art Davis Air Circus". Ogden, Bob (2007). Aviation Museums and Collections of North America. Air-Britain (Historians) Ltd. ISBN 0-85130-385-4.